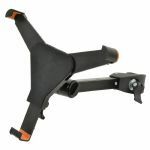 Notes: This adjustable mount for iPads features connecting attachments for securing to a microphone stand or a work surface. Applications include auto-cue for narrators, music scores for live performance and practice, and lyric display for singers. Notes: A universal tablet holder designed to clamp onto any kind of stand. The integral mechanisms in the clamp allow for easy installation with no tools required. The holder is fully adjustable allowing the tablet to be used in any orientation. A great accessory to assist hands-free auto-cue for narrators, music scores for live performance and practice, and lyric display for singers. 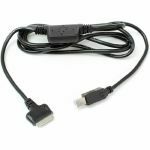 Notes: 30pin Connection Cable for your iConnectMIDI2+, iConnectMIDI4+ or iConnectAUDIO4+. 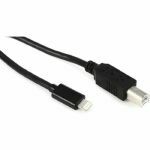 The Inline iOS Connection Cable connects the iConnectMIDI2+ and the iConnectMIDI4+ through USB Type B ports to your iOS device including iPod touch, iPhone and iPad through the 30-pin dock connector; giving you the best possible performance. Notes: Lightning Connection Cable for your iConnectMIDI2+,iConnectMIDI4+ or iConnectAUDIO4+ The Inline iOS Connection Cable connects the iConnectMIDI2+ and the iConnectMIDI4+ through USB Type B ports to your iOS device including iPod touch, iPhone and iPad through the Lightning dock connector; giving you the best possible performance. Notes: Holds any tablet sized 7" to 12.9" with or without case. Smart bracket leaves buttons and ports accessible. Spring mechanism installs fast and rotates your tablet 360 degrees. Rubber grips secure your device without scratching. Freely adjustable viewing angle up to 90 degrees. Compatible with any 1/4"-20 thread. Mounts to any pole up to 1.2"/30mm diameter. Built in support bracket for iRig devices. Notes: Easily mount any tablet to a microphone or music stand. Fits tablets from 7" to 12.9" in portrait or landscape orientation, with or without case. Perfect for sheet music, lyrics, chord charts or performance apps. Soft-touch rubber pads hold tablet securely without scratching or marring. Ball joint connection provides easily adjustable viewing angle. All ports and controls remain freely accessible. Made from rugged thermoplastic for reliable performance. Designed in Italy. Easily mount any tablet to a microphone or music stand. Fits tablets from 7" to 12.9" in portrait or landscape orientation, with or without case. Perfect for sheet music, lyrics, chord charts or performance apps. Soft-touch rubber pads hold tablet securely without scratching or marring. Ball joint connection provides easily adjustable viewing angle. All ports and controls remain freely accessible. Made from rugged thermoplastic for reliable performance. Designed in Italy. Notes: Re-designed and re-engineered from the pioneers of tablet support. Quick-attach clip for faster connection of mounting bracket. 360-degree rotation of the mounting bracket for improved positioning. New mounting support for iRig accessories. Larger, more durable rubber grips. Improved fit for iPad Pro and other large-format tablets. Notes: The multi-angle viewing stand case for iPhone 6. Take a stand anywhere you go with a protective carrying case with positionable legs for iPhone 6. Introducing the iKlip Case series for iPhone 6 and iPhone 6 Plus. It's a protective carrying case with an easy-to-use built-in multi-position stand for musicians and more. A fusion of functionality and durability, it ensures that you'll always be able to set up your iPhone for effortless viewing: Use it while playing instruments with apps on your phone, while reading in coffee shops, while giving presentations and a whole lot more. With iKlip Case, you can take a stand anywhere you go. At its heart, iKlip Case is all about its built-in stand system. This stand system lets you position your iPhone for use in 1 of 4 different viewing angles. It features two large wing-like legs that can be quickly expanded to switch between 2 set angles per viewing orientation: Portrait mode can be viewed at 60- and 45-, and landscape mode can be viewed at 80- and 60-. In either configuration, iKlip Case offers a sturdy and firm hold that's as good for making music as it is for watching movies, playing video games or surfing the web. iKlip Case is dependable. With it, you'll be safe in the knowledge that your iPhone is strongly protected. Its body has been industrially designed in Italy - it sports the most rugged and durable materials on the market. Its body is made from a lightweight and shockproof thermoplastic (TPU), and its legs have been constructed from rigid Polycarbonates (PC) plates. These materials have all been chosen to provide security and peace of mind under even the most demanding of circumstances. You can use iKlip Case with the full spread of IK apps: like AmpliTube for guitarists, VocaLive for singers and iRig Recorder for journalists. iKlip Case leaves all device ports and controls freely accessible, which makes it the perfect complement to IK's entire range of high-quality accessories. iKlip Case is part of IK's iKlip family of products designed to hold mobile devices, smartphones and tablets securely in place for a multitude of uses for musicians, broadcasters, creative professionals and hobbyists. Notes: iKlip GO is the latest addition to IK's line of professional supports and accessories for tablets, smartphones, compact digital cameras and action cameras. It is an elegant, ultra-compact selfie stick with a Bluetooth Shutter that extends to a whopping 74 centimetres (29.1 inches), allowing you to take fantastic overhead shots of your best life moments with your family, friends and during your trips. iKlip GO features an expandable grip to securely hold your iPhone or smartphone, even with a case, and its ball-joint attachment allows you to precisely position any device at any angle for capturing photos, video, and audio at a 90-degree angle and 360-degree rotation. iKlip GO includes a practical Bluetooth shutter, which works with both iPhone and Android, to take pictures from a distance or shooting videos. iKlip GO features a universal mount for compact digital cameras, action cameras, and field recorders. This feature is especially useful if you aim at shooting over-your-head, high-quality video clips of live shows, street events or capturing audio on the ground from different positions. iKlip GO is part of IK's iKlip family of products designed to hold mobile devices, smartphones, and tablets securely in place for a multitude of uses for musicians, broadcasters, creative professionals, and hobbyists. Notes: iKlip Grip Pro is the new large-grip, compact multifunctional iPhone and camera stand with an integrated detachable Bluetooth shutter control that is really 4 accessories in one: super secure tabletop tripod, large-grip video handle, monopod handle and standard tripod adapter. iKlip Grip Pro can securely hold any iPhone with or without a case, and features a standard mounting system for connecting small mobile video cameras like GoPror, compact digital cameras and stand-mount audio field recorders. iKlip Grip Pro features a large, ergonomic handle that expands into a sturdy tripod, an integrated locking extension pole that extends up to 62 cm (24") for getting those "above the crowd" shots and selfies, plus a detachable Bluetooth shutter control for remote shooting. The secret to iKlip Grip lies in its ingenious expandable and secure holding bracket that allows you to precisely position your iPhone at any angle for capturing photos, video and audio. iKlip Grip Pro features an expandable spring-loaded soft-touch rubber bracket that provides secure superior holding power, and it holds your iPhone with or without a case for an added layer of protection. Repositioning your iPhone is as simple as expanding the brackets to release it then re-securing it. And the iKlip Grip Pro holding bracket features standard UNC 1/4"-20 tripod screw threads so it can be mounted to any standard tripod as a mobile device adapter. iKlip Grip Pro has a large ergonomic (a fancy name for "designed to actually fit in your hand") design that is comfortable and really "fits" your hand. The new larger grip is perfect for stabilizing video and capturing "blur free" photos, especially in zoom modes. And while the base for iKlip Grip serves as a sturdy, steady handle when you're at a concert or trying to grab the perfect shot of the band for your Facebook feed, it also transforms itself (with a little help from you) into a compact tabletop tripod you can position on any relatively level surface for ultra-steady media gathering. The trick lies in its ingeniously designed locking handle - when closed and locked, iKlip Grip Pro is a handle suited for most "handler" tasks like selfies or ultra-steady video shooting on the go. But when unlocked, the handle magically transforms into a firm and sturdy tabletop tripod that is ultra-secure and steady. In tripod mode, you can easily shoot steady video and photos from a single location, or use the front-facing camera for hands-free FaceTime with your friends or live broadcast. All you have to do is fold the legs out you'll have a nice tabletop tripod for your video chats, Facebook Live, SnapChat or Periscope productions. iKlip Grip Pro also features an integrated ultra-stable, locking 4-segment telescopic extension pole. At any time you can simply unlock the pole and extend it to your desired length, up to a max of 62 cm (24.4"). And since the pole is integrated into the design, no additional assembly is required - it's always there and ready. The pole extension is perfect for the distant "selfie", but also ideal for getting "above the crowd" for audience-less band shots, closer-than-they-appear shots and anything in between. The extender also works in tripod mode so you can position your iPhone at the perfect distance above the table top. iKlip Grip Pro comes with an integrated yet removable Bluetooth smartphone shutter remote control that lets you remotely activate the shutter button in video and photo apps. A holder clip on the handle lets you use it as a thumb-activated shutter control, or when using iKlip Grip Pro as a table top tripod, you can easily detach the controller to capture shots remotely - perfect for shooting live video of your band or taking group photos. The remote is universally compatible with iOS 5.0 and above and can be operated up to 10 meters away from the device, perfect for capturing live performances, family vacation photos, movies and selfies. If you remove the iPhone holder grip from the iKlip Grip Pro, you'll actually have two products: a standard UNC 1/4"-20 universal handle, monopod or tripod for small digital cameras and action video cameras, plus a secure grip iPhone holder that can be used on standard tripods. This is handy when you need a more professional tripod in demanding situations but still want to use your iPhone for capturing stills and video. iKlip Grip Pro is the new large-grip, compact multifunctional iPhone and camera stand with an integrated detachable Bluetooth shutter control that is really 4 accessories in one: super secure tabletop tripod, large-grip video handle, monopod handle and standard tripod adapter. iKlip Grip Pro can securely hold any iPhone with or without a case, and features a standard mounting system for connecting small mobile video cameras like GoPror, compact digital cameras and stand-mount audio field recorders. Notes: It's every musician's nightmare: You're on stage. You're performing. But then something goes terribly wrong and your smartphone - which you're using to perform - suddenly crashes to the floor and its screen splinters into a million little glass pieces. It's enough to give anyone a heart attack. Now you can alleviate your fears and perform with confidence thanks to IK's new iKlip Xpand Mini. It's an adjustable smartphone holder that uses expandable grips that can hold most smartphone sizes securely. 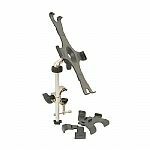 Its rubberized "Gorilla Grip" technology holds your mobile device on a microphone stand, and its ball joint design allows for infinite adjustment so you'll always have an optimal viewing angle. iKlip Xpand Mini features several breakthrough technologies that allows it to hold virtually any smartphone with a screen size of 3.5" to 6". You can even use it without removing the protective case of many of your favorite devices. First, iKlip Xpand Mini features a patented expandable holding bracket that utilizes an expansion "memory" bracket allowing you to quickly and easily snap an iPhone or any other smartphone into place and attach to a microphone stand. It has a rubberized "Gorilla Grip" surface that ensures a firm grip on the device without scratching or marring the surface. Its ball-joint global positioning system lets you precisely position your device at any angle for optimum viewing in both landscape and portrait modes. iKlip Xpand Mini features a universal mounting bracket for microphone stand poles allowing it to be attached to mic stands up to 1.2" (30mm) in diameter. Now you have the flexibility to attach your device to either the vertical pole or horizontal boom of most microphone stands. Like all IK products, iKlip Xpand Mini has been designed and manufactured in Modena, Italy - a city famous for high-performance Italian industrial design. Each product goes through rigorous quality testing to ensure that it will deliver the utmost in dependability and quality - iKlip Xpand Mini is designed to last performance after performance and night after night. We use only the highest quality components and materials so that you can do what you love and perform with confidence. Universal microphone stand support for iPad and other tablets up to 12.1"
Notes: It's every musician's nightmare: You're on stage. You're performing. But then something goes terribly wrong and your tablet - which you're using to perform - suddenly crashes to the floor and its screen splinters into a million little glass pieces. It's enough to give anyone a heart attack. Now you can alleviate your fears and perform with confidence thanks to IK's new iKlip Xpand. It's an adjustable tablet holder that uses four expandable grips that can hold most large tablet sizes securely. Its rubberized "Gorilla Grip" technology holds your iPad or tablet on a microphone stand, and its ball joint design allows for infinite adjustment so you'll always have an optimal viewing angle. iKlip Xpand features a patented expandable holding bracket with a soft rubber contact surface that adjusts to the width of your device providing a safe and secure way to hold your tablet firmly. With iKlip Xpand, you can position your device exactly where you want it and rest assured it will stay in place. iKlip Xpand features several breakthrough technologies that allow it to hold virtually any tablet with a screen size from 7" to 12.1". You can even use it without removing the protective case of many of your favorite devices. First, iKlip Xpand features a patented expandable holding bracket that utilizes an expansion "memory" bracket which allows you to quickly and easily mount an iPad - or similarly sized tablets - to a microphone stand. Its rubberized "Gorilla Grip" backing ensures a firm grip of the device that neither scratches nor mars your tablet's surface. Its ball joint global positioning system lets you precisely position your device at any angle for optimum viewing in both landscape and portrait modes. iKlip Xpand features a universal mounting bracket for microphone stand poles - it can be attached to any pole with a diameter of up to 1.2" (30mm). Now you have the flexibility to attach your device to either the vertical pole or horizontal boom of most microphone stands. Like all IK products, iKlip Xpand has been designed and manufactured in Modena, Italy - a city famous for high-performance Italian industrial design. Each product goes through rigorous quality testing to ensure the utmost in dependability and quality - iKlip Xpand is designed to last performance after performance and night after night. We use only the highest quality components and materials so that you can do what you love and perform with confidence. Notes: The Shockshell features Slappa's patented Core3 Technology which was designed to offer the most complete protection for your digital gear using 3 distinct layers of material that offer secure storage, shock absorbency and a solid barrier between your gear and the outside world, preventing scratches, dents and jarring. Tons of protection with surprisingly little bulk; the ShockShell adds only 0.75 cm to the thickness of your mini and weighs less than 3 oz. You won't find another storage case for the iPod mini out there like the ShockShell. Join the industrial revolution. Impress fellow road warriors with this diamond-plate case in your grip, or on your hip.